A study of haptics, embodied perception and an Anarchival (SenseLabâ) study of strata. What if the walls, the floors, the thresholds of our spaces were the mouthpieces of our time on earth? What would they say? Choreutics is defined in Dance and the Performative as Rodolph Laban’s study of the spatial form embodied in movement. Within Choreutics two elements are observed, micro-choreutics and macro-choreutics. Micro-choreutics “…researches the spatial content of movement within the kinesphere”, while Macro-choreutics, “studies, practically and theoretically, the spatial forms of a work as a whole including the whole performance space by locomotion and group forms” (2002). Through this choreographic work I discovered a deep seeded relationship to Laban’s Choreutics. My research for this work examines the process of embodied cognition as it engages with an environment, traversing the succession of Space to Place to Home. To form a better understanding of this task I began by investigating the micro-choreutics of the body. By doing so, I was led on a journey into perception and sensation. My body developed a deepened sensitivity to elements in space, and in turn, a sensitivity to that which contains them, the architecture of a room. According to Philosopher Gaston Bachelard, the chief benefit of the house is to shelter day-dreaming. “The house protects the dreamer; the house allows one to dream in peace”. I wanted to create an environment, space, for the audience to dream. Rather than focusing on the traditional objects stored within the walls of a home, I wanted the focus to be on the structural walls themselves. I ask, what if the walls, the floors, the thresholds of our spaces were the mouthpieces of our time on earth. What would they say? The solo movement in this piece was quarried through haptic explorations, embodied visual perception of architecture and a study of strata. I began by harvested movement through embodying the lines of strata in the mountains. Each line of strata was segmented by different level planes in my body. These movement segment were then assigned a colored transparency. The transparencies were shuffled, drawn in random order, laid on top of one another and then photographed. I used this layering to create new movement order, breaking habitual patterns in my body. 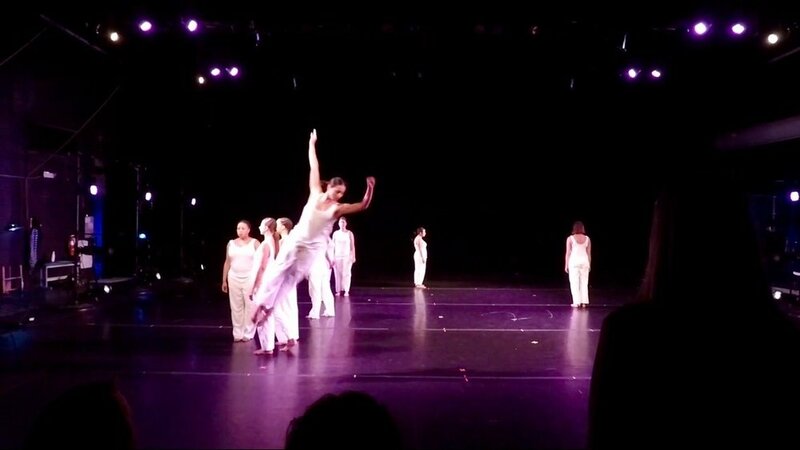 Additionally, I used the angles created through the layering to determine my personal directional pathways in the space during the solo movement. I was then led into a macro-choreutics exploration of spatial patterning. I investigated the idea of thresholds, where we go out from and where we return to. I also asked my dancers to move through the spatial floorplans of their childhood home, their current home and then engage in a toggling of the two together as if splitting time with the body. This in combination created the movement in the second portion of the work. Finally, I chose to choreograph a single dreamer, different yet the same as you all my audience. This was done to purposely bring attention to the present moment almost as an anchor. Left open is the interpretation and narrative of the observer’s involvement. Are we watching her dream? Are they her memories? Is she causing the event to occur or is she just a representation of all of us engaging in the space together? It is for you the viewer to decide. Preston-Dunlop, Valerie Monthland, and Ana Sanchez-Colberg (2002). Dance and the Performative: A Choreological Perspective: Laban and beyond. London: Verve, Print. Richet, P. (2010). A Natural History of Time. Chicago, Ill.: University of Chicago Press. Tuan, Y. (1977). Space and Place: The Perspective of Experience. U of Minnesota Press. Zaborowski, H. (2005). Towards a Phenomenology of Dwelling. Communio: International Catholic Review. Zumthor, Peter, (1998). Thinking Architecture. Baden: Lars Muller, Print.